Are you ready to COMMIT to better health? Start your 21 day trial of our Beginners Fitness Classes and bring a friend for FREE! Get daily health & fitness tips and inspiration for beginners to fitness along with support from all our Feel Good Fitness members. Are you ready to COMMIT to better health? Start your 21 day trial of our Beginners Fitness Classes and feel the difference! 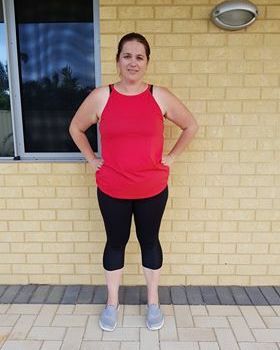 We are Mandurah’s First Beginners ONLY Fitness Studio, with various programs available to help you transform your life in a safe and supportive space. Whether you want to lose body fat, improve mental health, meet new friends, or just feel stronger and more energetic, we have a program that will help get you where you want to go. View our videos to see what our classes are like and what our members have to say, then get in touch to arrange your 21 day trial! Whether Fifteen 2 One or Five 2 One, our group beginner fitness classes are friendly, supportive and fun. Training by yourself or with one or two buddies, our private beginner fitness sessions will target your specific needs. Add some variety to spice up your routine with our beginners Dancercise and Boxercise classes. Places are limited! I love feel good fitness!!! I'm not a self starter when it comes to fitness I really feel like I can connect with people here who have the same struggles and its such a team environment!! nothing but positive vibes and awesome people. best of all no judgement!! and it doesn't matter where you start so long as you do. so thankyou steve, Jacob and the team at feel good I can't wait to see this journey unfold!!! Always feel great after a class and it is nice to work out with like minded people in a relaxed friendly atmosphere glad I found beginners fitness. Feeling alone and depressed after leaving family and friends behind to move to WA, Cassie had no energy or motivation to do anything. In the photos we see Cassie in October 2017 after being with Feel Good Fitness for 3 months, and again in August 2018 having made great progress despite having to take 3 months away from training due to a knee injury. 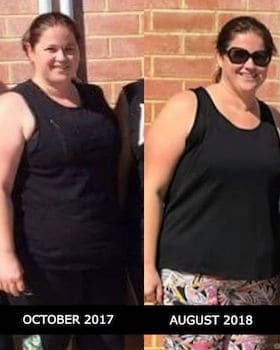 In December 2018 we can see she is still kicking her goals, and is such an inspiration to all her fellow gym buddies! What would Cassie say to others considering joining Feel Good Fitness? Feel Good Fitness WA is offering a 21 DAYS for $21 TRIAL to those who are committed to improving their health and wellness. If you have any questions be sure to check out our FAQ page, or get in touch if you’d like to chat. Have fun while kicking your goals! You can earn $50 each time you refer a friend or family member to Feel Good Fitness WA! Over $1600 given away so far! We are so excited after so many members have brought their friends and family down to experience our beginners exercise classes that we wanted to go the extra mile to show our appreciation to our wonderful members. 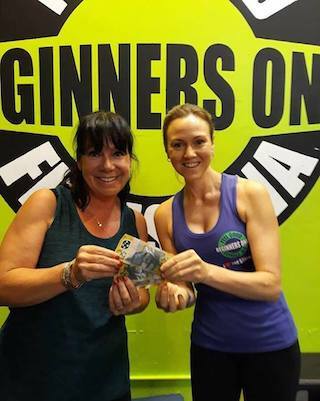 Building a safe, supportive and FUN community for beginners to fitness is our vision at Feel Good Fitness, Mandurah’s first beginners only fitness specialists. *Only for existing Feel Good Fitness members. Ts and Cs apply.